Casa de la Vista: A former Officer’s Club built in 1943, Casa de la Vista offers spectacular views of San Francisco’s skyline and surrounding islands. ceiling give the space a light, open feeling. shade and an intimate backdrop. Named “Best Place To Say ‘I Do’ in San Francisco” by 7x7 Magazine, Treasure Island’s Casa de la Vista has the most spectacular views of The City you’re likely to find anywhere. Maximum Capacities180 Seated with a Dance Floor 300 Standing. Wine Valley Catering was founded by Peter and Lorene McCaffrey in 1994 determined at bringing restaurant quality food and wait service to wedding and event catering. Wine Valley Catering is committed to producing and serving quality cuisine with first class service. Wine Valley Catering staff members have a combined total of over 125 years of experience in the industry. It’s this experience and training that enable our clients to completely depend upon Wine Valley Catering to make your wedding PERFECT! see the different amenities that are included in our pricing. We take great pride in the reputation we have diligently built over the years and are eager to put our talents to work for you! This award recognizes the top 5 percent of local wedding professionals from the WeddingWire Network who demonstrate excellence in quality, service and professionalism. We are socially and environmentally conscious company implementing many practices to be green and to better our low carbon foot print and to stay sustainable by incorporating local produce and respecting our earth. 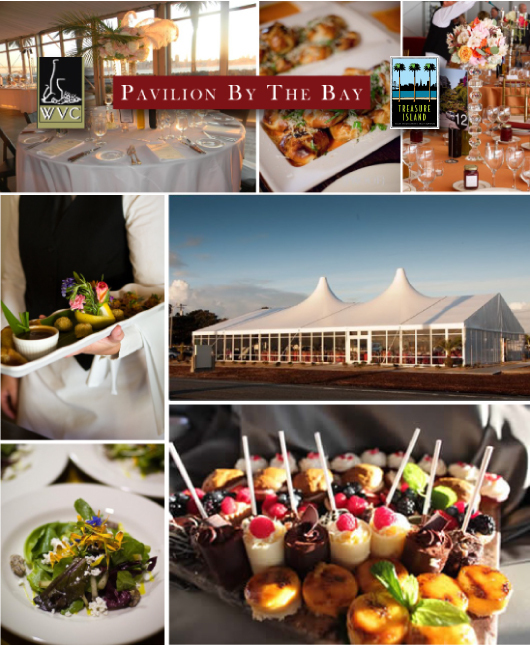 Pavilion By the Bay - the new venue on Treasure Island in San Francisco. With our experience and training you can depend on us to make your event PERFECT! The Pavilion By the Bay was developed with your budget in mind during these challenging times. We invite you to experience the beauty of the city by the bay, San Francisco, from a short distance while you?re looking at its Skyline and bridges. You will experience world-class cuisine that will compliment your style and budget as well as high-end service.